Home to a community that’s been going strong for a century, Ukrainian Village is a unique and thriving part of West Town. The neighborhood is anchored by its Ukrainian businesses, churches, and community buildings, many of which were established generations ago. Now, more and more brand new businesses, hotspots, and homes are coming in. Ukrainian Village boasts a beautiful historic look with a trendy neighborhood feel and true tight knit community. As your Ukrainian Village movers, we’ll be happy to help you settle in your new home, so you can find your place here too. In Ukrainian Village, men outnumber women by a very slight margin. The 52,000 residents have a median age of 30, and many have kids. Many adults have at least a bachelor’s degree, but all levels of education are represented. The average household income is $92k a year. 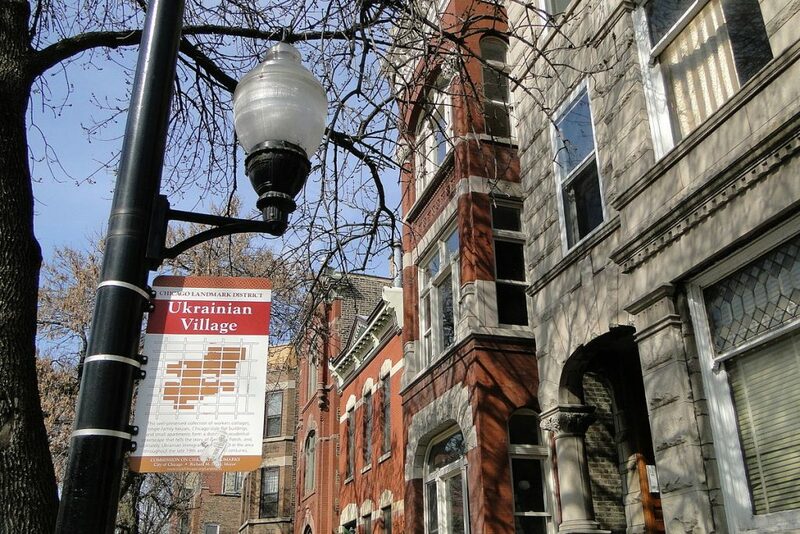 Since the end of the 19th century, Ukrainian Village had been known as a hub for Eastern European immigrants. It first attracted a significant swath of Ukrainian residents during World War I. Immigrants from Ukraine continued to join the neighborhood throughout the 20th century, bringing diverse skill sets and establishing . The Ukrainian community remains strong today, though new residents from other backgrounds continue to join and enrich the area. Now you’ve got the gist, here are some highlights—and basics—we found to help you start your best Ukrainian Village life. Commercial Club Park: Indoor and outdoor sports facilities. West Town. Western Park: Playground and shady seating. Ukrainian National Museum of Chicago: Community celebrations and events. Ukrainian Institute of Modern Art: Showing cross-cultural perspectives for over four decades. Vertical Gallery: The place to appreciate street art. Pizza: Naty’s Pizza. Classic neighborhood joint that delivers. Thai: JJ Thai Street Food. For delivery or sitting in. Mexican: Takito Kitchen. Cocktails and weekly specials. Southern USA: Leghorn Chicken. Counter service. BYOB. Classic Ukrainian: Old Lviv. Buffet with traditional favorites. Hip Ukrainian: Tryzub Ukrainian Kitchen. A modern spin. Vegetarian friendly. Burgers: WHISK. Brunch in the day time, fresh burgers in the evening. BYOB. Farm to Table: Homestead on the Roof. Rooftop with extensive drink menu. Brunch: Bite Cafe. Also lunch, dinner and dessert. BYOB. After the Meal: Black Dog Gelato. Fantastic flavors for any time of day. Cocktails: Queen Mary Tavern. Naval-themed craft mixes and snacks. Beer: Fatpour Tapworks. Big pours of over 200 options. Beer with Food: Forbidden Root. Unique beer from “botanicals,” paired with menu. Music: The Empty Bottle. Indie artists, plus food. Games: The Blind Robin. Cash only. “Dive”: EZ Inn. Throwback with dancing and events. Local: Stella’s Sports Bar, aka Stella’s Tap. The tap is PBR. Mariano’s: Full grocery with prepared food. Rich’s Deli: Eastern European groceries. Dollop Coffee Co. and Bakeshop: Sandwiches and baked goods. Francesca’s Cafe: Local, homemade pastries. Shokolad Pastry and Cafe: Baked goods, cakes and Ukrainian dishes. Dark Matter Coffee: Roastery and coffee drinks. The “Mothership” location. Wicker Park Athletic Club: Full equipment and classes, a short way away. Rebel Sport & Fitness: Private training and group classes. This has been a tiny sampling of the great things you’ll experience at your new Ukrainian Village home. As a seasoned Ukrainian Village moving company, we’ve learned all about the staples and cool places in the area. We’re happy to share more! As you’re planning your big move, cross one major thing off your to-do list, and book Ukrainian Village movers who’ll a take load of stress off your mind. Call us at New City Moving, and we’ll help you move safely, smoothly, and on-schedule, so you can settle right in and start living your greatest Ukrainian Village life.